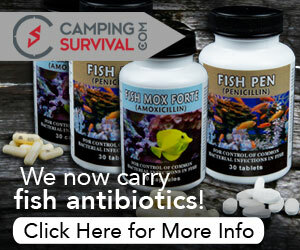 Alright, I have another product review for you guys. 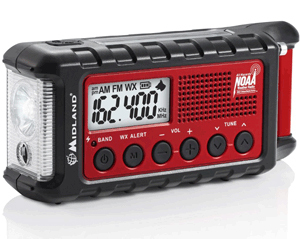 This one is about the Midland ER300 emergency radio. 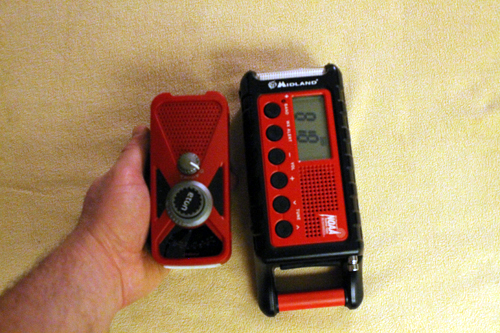 For the last couple of years I’ve been primarily stocking my bug out bag with the Eton Microlink emergency radio. The Microlink is a pretty good little radio, its very compact, and fits perfectly in a bug out bag. 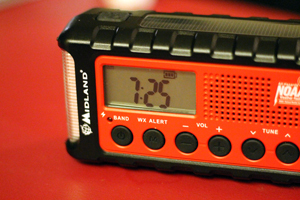 The Midland has now become my go to emergency radio for my bug out bag. After getting this radio in the mail and opening the packaging I thought to myself, “dang, this thing is big”. In fact, I was a little disappointed with the size. Since I’m all about minimizing the bulk and size of my bug out bag I was a little bit put back with the size of this and didn’t think it would’ve been a good fit. It appeared to be of better quality and sturdier then the Eton but for this reason alone I didn’t feel it would’ve been a good replacement for the Eton. This is one of the huge sellers for me that I feel that Eton is lacking. 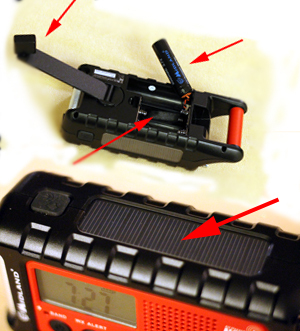 Like the Eton, you can charge the battery with the integrated solar panel, or by handcrank. However, not only is the lithium-ion battery pack replaceable (the Eton also has this feature), but it can also store six AA batteries as an extra power source for backup (what the Eton doesn’t have). Finally, there is a toggle switch that allows you to switch between these two power sources so you don’t drain them both at the same time. 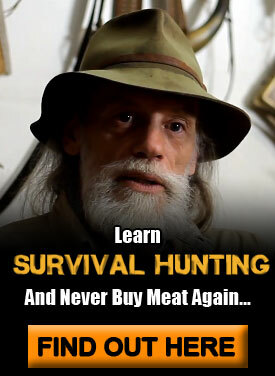 This was another big selling point for me. It’s about time an emergency radio uses some of the Cree LED lights. 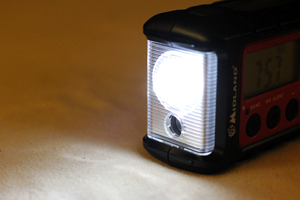 This one pumps out a whopping 130 lumens on high and also allows you to run it on a lower setting to conserve power. Midland claims that this may be helpful for search and rescue teams using dogs in locating individuals in distress. Having been involved in local SAR teams myself, I haven’t heard of something like this being used before, so I originally wrote it off as more gimmicky than practical. However, after some thought I think that this would actually be a pretty cool thing if you have a dog. It wouldn’t be difficult to train your dog to come to the sound of this whistle and I could see a lot of applications where you would want to covertly call your dog to you — especially in a precarious bug-out situation where yelling for your dog might attract unwanted attention. This is a fantastic option that the Eton (and even higher-priced radios) don’t have. Basically, you can switch the radio to “alert mode” where it will monitor actively — in real time — for any weather alerts. 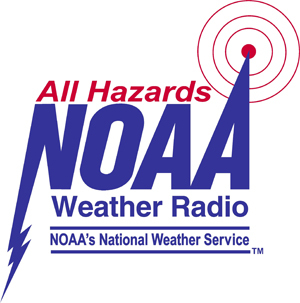 So for example, say you were sleeping and there’s some serious weather that’s coming your way…the radio would alarm and flash — waking you up and automatically turning to the channel to broadcast what the weather issue is. This real-time alert could make all the difference in getting it to your safe room in time or being able to evacuate from an area before you’re stuck behind with the crowds…or worse. Morse code isn’t as popular in the military or even in amateur radio as it used to be. However, SOS (… – – – …) is one of the few signals that even many laymen not trained in Morse code can recognize. 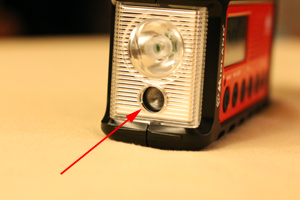 The SOS beacon in the flashlight provides you a hands-off way of broadcasting an SOS transmission – freeing you up to work on other survival tasks. finally, the Midland also has a USB device charger. Having the ability to charge your devices like a smart phone or even a Kindle or other reading tablet packed in your bug out bag, is a great feature. *Note: The Midland does not provide enough power to charge an iPad, but is fine for an iPhone, Kindle or other similar device. The digital display of the Midland is another big plus over the Eton. With the Eton’s small knobs, it’s sometimes difficult to tune to the channel you want as well as know exactly which channel you’re on. With the digital display, there is no confusion or difficulty tuning to the channel yo want. Finally, it’s nice that it has a clock display. If you caught it in the comparison chart above, you can see that the price for this radio is around $80. While it is two times the amount of Eton radio, I feel that the larger price is worth those extra features. The cheapest place that I found you can buy it is (like many things) on Amazon.com: Buy the Midland ER300 on Amazon here. When comparing the two radios, I definitely feel that the added features of the Midland are worth the extra cost and bulk. 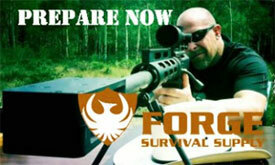 If you haven’t yet stocked your bug out bag with an emergency radio, I definitely recommend this one.